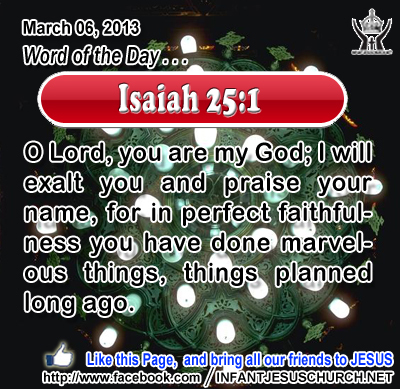 Isaiah 25:1: O Lord, you are my God; I will exalt you and praise your name, for in perfect faithfulness you have done marvelous things, things planned long ago. Heavenly Father, you surprise us with new wonders and new things daily. Yet deep in our heart we know they are not new to you. Thank you for not making life boring or predictable so we might thirst after you, you who are forever fresh, new, exciting, and wonderful. In the name of Infant Jesus, we pray. Amen. 17"Think not that I have come to abolish the law and the prophets; I have come not to abolish them but to fulfil them. 18For truly, I say to you, till heaven and earth pass away, not an iota, not a dot, will pass from the law until all is accomplished. 19Whoever then relaxes one of the least of these commandments and teaches men so, shall be called least in the kingdom of heaven; but he who does them and teaches them shall be called great in the kingdom of heaven. Jesus taught reverence for God's law respect for God himself, for the Lord's Day, reverence or respect for parents, respect for life, for property, for another person's good name, respect for oneself and for one's neighbor lest wrong or unkind desires master us. Reverence and respect for God's commandments educate us the way of love - love of God and love of neighbor. What is impossible to men and women is possible to God and those who put their faith and faith in God. Through the gift of the Holy Spirit the Lord changes us and makes us like himself. We are a new creation in Jesus because "God's love has been poured into our hearts through the Holy Spirit which has been given to us". God gives us the grace to love as he loves, to think as he thinks, to forgive as he forgives and to act as he acts. The Lord loves justice and goodness and he hates every form of wickedness and sin. He wants to set us free from our disorderly desires and sinful habits, so that we can choose to live each day in the harmony, joy, and righteousness of his Holy Spirit. To renounce sin is to turn away from what is damaging and destructive for our minds and hearts, and our very lives. As his followers we must love and reverence his commandments and hate every form of sin. Do we love and revere the commands of the Lord? Loving Infant Jesus, grant this day, to direct and sanctify, to rule and govern our hearts and bodies, so that all our thoughts, words and deeds may be according to your Father's law and thus may we be saved and confined through your mighty help.